A Godfather, a “Soap”rano, now a Caveman. Philadelphia local, Vince Valentine, has seen his share of stages and microphones while making audiences laugh in venues across the country. Vince’s stand-up story starts over a decade ago at Camden County College, where he enrolled in a comedy workshop just because he enjoyed making others laugh. Since it was “one of the best things [he] ever did,” he’s now teaching the same class that taught him all about the craft of comedy, including the tricks, writing, and art of a comedic performance. 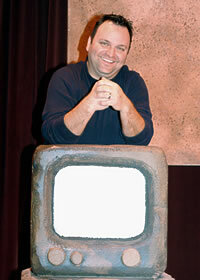 So far, his performances include various interactive comedy shows where Vince portrays a member of an infamous mob family in the live parody, The Soapranos. Vince also makes clients offers they don’t want to refuse, as he impersonates the Godfather along with John Monforto and other famous friends during a customizable show for all audiences. Valentine is also a writer and performer with a Philadelphia sketch comedy group, the Skitzoids, who have performed during the Philadelphia Fringe Festival. Venturing off stage and in front of a camera, Vince has appeared on Forensic Files and has given such a realistic performance that even his mother doesn’t want to watch. He’s also gone dramatic for an independent film, but admits that even when he tries to be serious, people still can’t help but laugh. Vince credits a few people that have been there since the early, “scary”, stand-up years and continue to mentor and support him. Bill Primavera, who Vince refers to as Yoda, was the Director of the Soapranos show, and he introduced Vince to New York acting guru, Carol Fox Prescott, or the Oracle (The Matrix reference here) as Vince lovingly calls her. Both were instrumental in making Vince feel “fearless” as he tackled auditions and onstage performances, and that feeling only continues to grow with each gig. On the professional side, Vince is grateful for the opportunity to meet Ellen Wasser-Hrin and the agents of Model Management Agency through Kathy Wickline Casting. 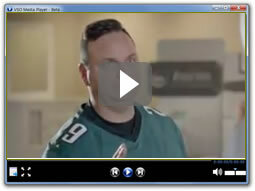 Through MMA, Vince has worked on a variety of commercials, industrials, and film. With every audition and booking, he’s never concerned about being prepared, since the staff at MMA is always on-point, making sure all details are covered. For those looking to break into comedy or acting, Vince recommends starting where he did, workshops. Taking classes is one of the best ways to learn about the craft. Then, of course, if you want it, do it. Perform in front of family and friends. Write a screenplay or for the stage. Just don’t get too ahead of yourself. Find a job with flexible hours, don’t try to become a starving artist when there are ways to do both. Social media makes it easy to network, so find those who are doing what you want to do and find out how you can get involved. Networking is what helped make Vince a Caveman. The first mention of the show came from a friend he was currently working with in The Soapranos, Kim McCall Armer. He submitted a tape, but never heard back. Then fate smiled on him when another friend and cast mate, Ms JoAnn Tufo, handed him a signed copy of Variety, one that featured an ad geared to theaters and producers interested in the show. Luckily the ad listed contact information. Vince answered with a query about acting, and the rest is prehistoric history. One of the best parts of the show for Vince is watching the progression of emotions in the couples who may have been a little distant to each other before the show, but leave hand in hand. Vince revels in the fact that this show can uncover the differences each couple may face, and teach them they’re not in this alone. Each performance is like a “conversation with the audience” and there’s a satisfaction in making a true connection with the couples he’s playing to. While the larger venues are “good for the ego,” Vince prefers standing before a smaller audience where it’s as intimate as “sitting at the kitchen table.” This makes it easier to bring people together and create the relaxed atmosphere that gives this show more appeal. Whether comedic or dramatic, Vince Valentine certainly has the appeal audiences are looking for. 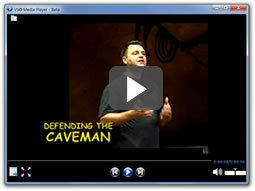 DEFENDING THE CAVEMAN will be showing at the Prince Music Theater April 18th-May 13th. Ticket information can be found at princemusictheater.org or defendingthecaveman.com, where you can also found out more about the show and Vince.